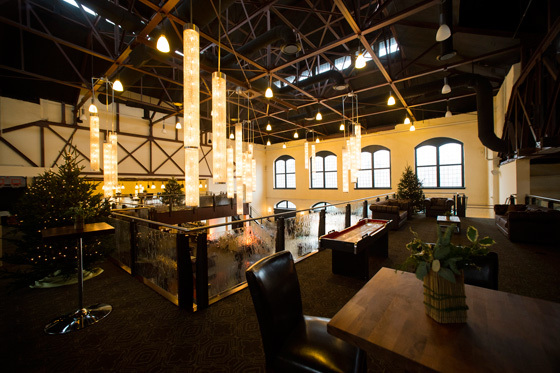 Each of the 250 guests at this 2015 company holiday party must have been pleasantly surprised when they entered Phoenixville Foundry on December 11th. 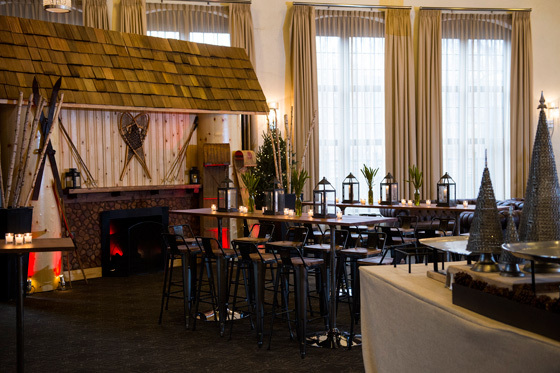 This Greater Philadelphia venue had been completely transformed into a cozy Colorado ski lodge! 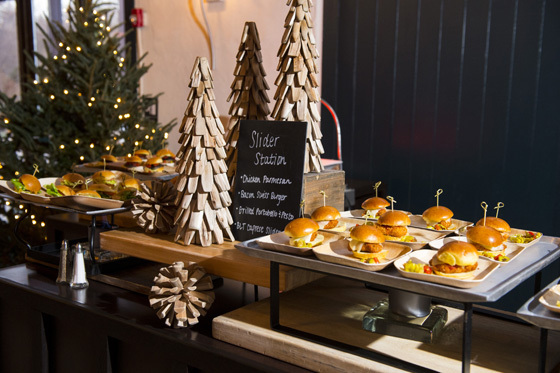 Our creative event designers, operations team and catering staff personalized the entire holiday party, from the custom ski bar and indoor and outdoor fireplaces to the incredible selection of hearty—and nutritious—farm-to-table menu items. Coordinating with multiple vendors and using tremendous attention to detail were the keys to our success. 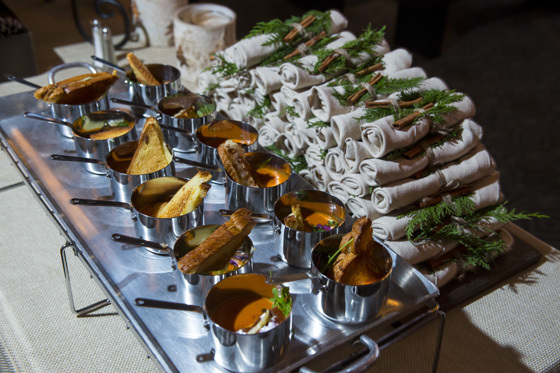 Here is a more intimate look at why this event was truly a work of art and catering expertise.They made our vision come to life. The weather gods were with us on that chilly evening in December, as it certainly helped set the scene for our holiday mountain theme. 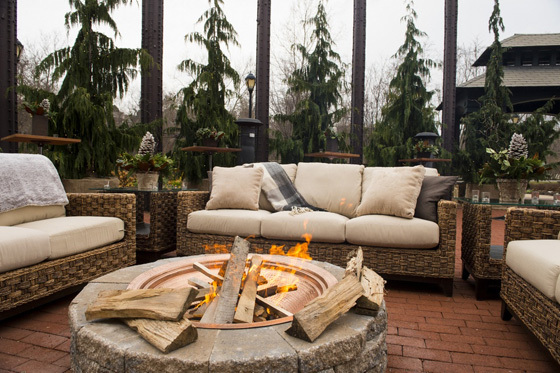 In the overcast but dry weather, guests could toss a plaid or fur blanket over their shoulders and snuggle up near a warm fireplace or outdoor heater. 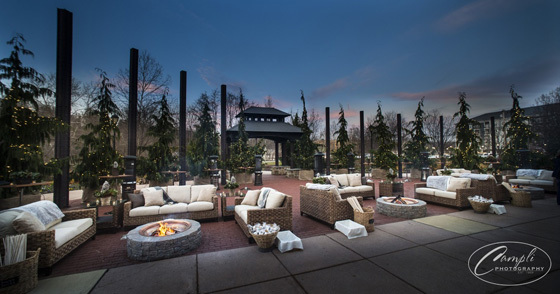 For those wishing to be in the rustic indoor space, we invited them to get comfortable on our leather couches or wooden chairs near the indoor fireplace. The gorgeous open concept of the Phoenixville Foundry allowed us to bring in 10 freshly cut Douglas fir trees to place around the venue. Alaskan cedar trees set the scene on the patio. The strings of white holiday lights on each tree added to the warm glow from the pendant lights, tea lights and copper décor. 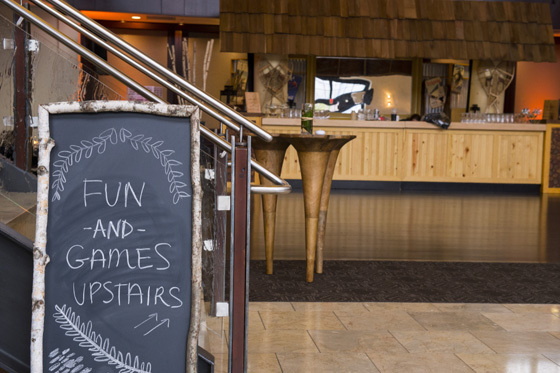 Our client envisioned a relaxed atmosphere where guests could easily pick up food and get social. 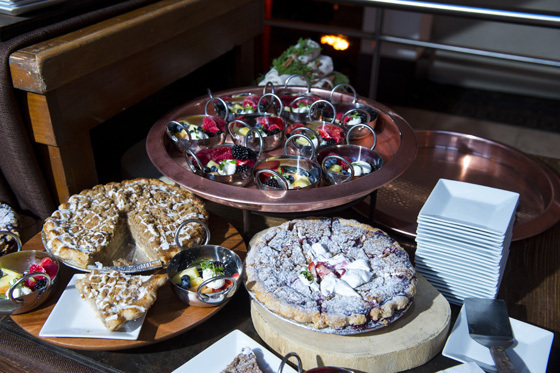 So, we expertly placed food stations throughout the venue to make this corporate holiday party a bustling masterpiece! Our farm-to-table menu items packed nutritional value into each tasty bite. Plus, they looked amazing! 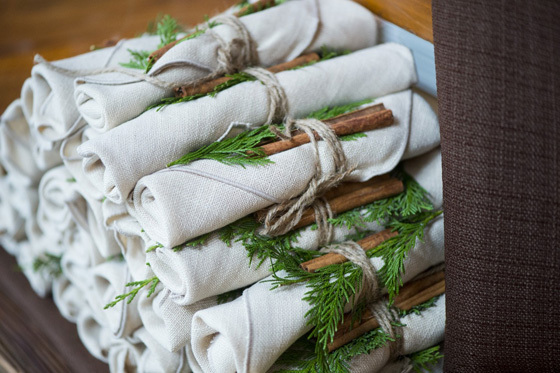 Our eye-catching rolled napkins were each adorned with a cinnamon stick and sprig of greenery for a fun way to accent each dish. 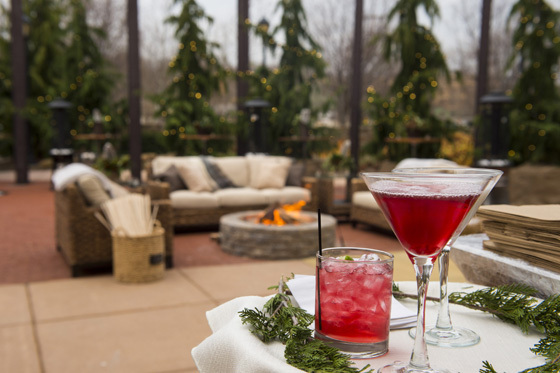 We put a spin on the classic holiday drinks served at each of our custom ski lodge bars. 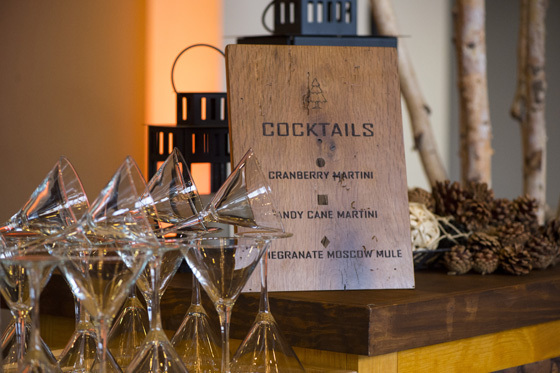 Who could turn down these signature holiday party drinks? Non-alcoholic drink options were available as well. Our Greater Philadelphia guests finished their evening at the Phoenixville Foundry with the most heart-warming dessert imaginable: warm peach, apple and berry cobblers served with decadent vanilla gelato. 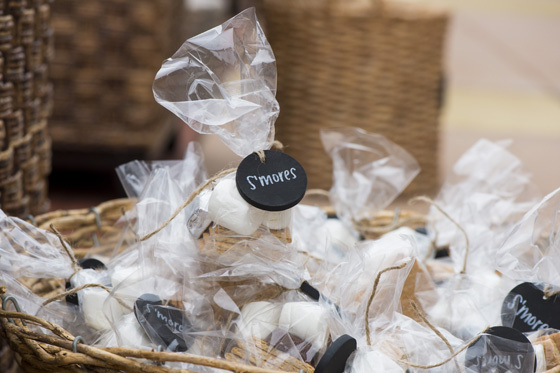 And for the kids at heart, we had individually wrapped packages of s’mores ingredients near the outdoor fireplaces. Guests did not even have to search for their own roasting sticks. They just grabbed a wooden stick from the basket and joined in the roasting! 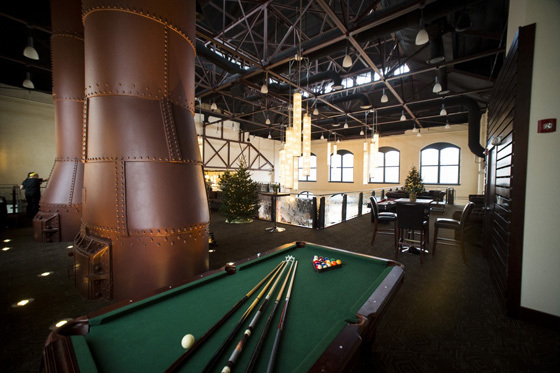 The dramatic double stairway leading up to the mezzanine level of Phoenixville Foundry was the perfect place for our holiday party games and entertainment. Guests could find their competitive edge with friendly rounds of shuffleboard, pool, foosball or pop a shot (basketball hoop game). Of course, our DJ completed the ambience with a list of songs ranging from holiday classics to top hits. This was truly an unforgettable night for us and for our clients. 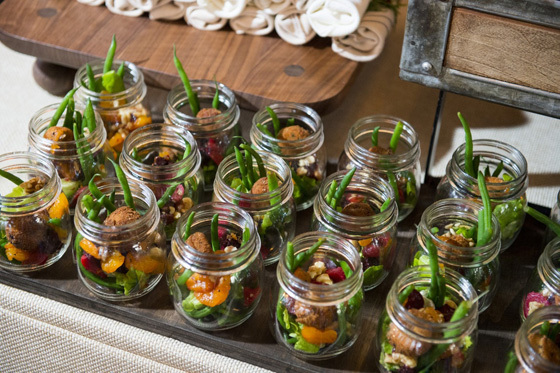 We would love to treat your corporate guests to an event that perfectly suits your vision, as no challenge is too large for our Philadelphia catering team. To find out more about how our creativity and award-winning attention to detail can help your unique style shine, contact us online or give us a call at: (610) 725-9420.